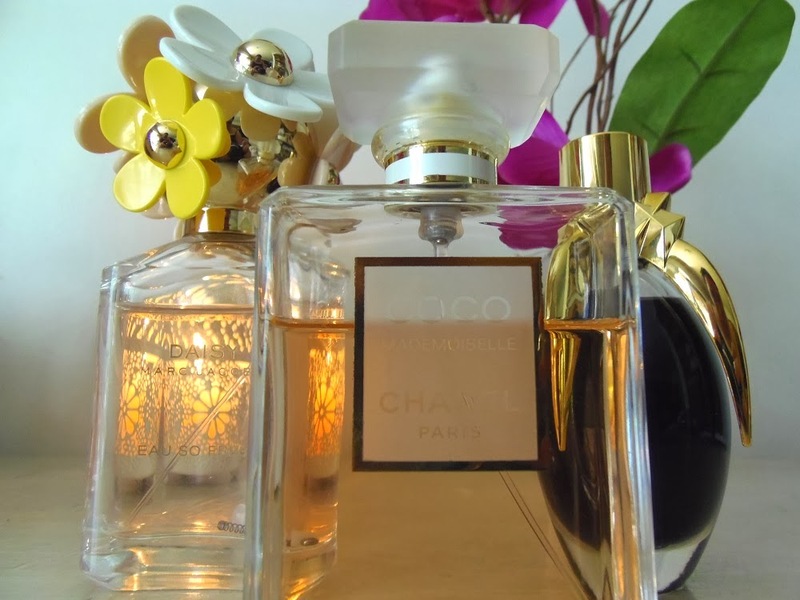 Here are, of my collection, my favourite perfumes. He aquí algunos de mis favoritos de mi colección. 5: So Givenchy: I got this perfume over five years ago, but since this is one of the limited edition perfumes from Givenchy, I'm trying no to use it up because well, I can't get it again. Este perfume lo tengo desde hace más de cinco años, pero como fue una edición limitada de Givenchy, estoy tratando de no usarlo mucho porque, bueno, no puedo conseguirlo de nuevo. 4: Flower Tag by Kenzo: this was my self-bday-gift of 2012. Since my birthday is during winter I got myself a nice wintery scent. I really love this perfume (I already used about half a bottle), but is a very strong scent and doesn't really go with summer. 3: Fame, by Lady Gaga: this was one of my latest additions to the collection. I really like the scent and it's like nothing I own. It's a bit sweet at first but then the scent sort of changes. I can't explain it really well, so I recommend you go and try it. I love it and the best thing, is it's one of the cheapest (good) perfumes you can get. Esta es una de las últimas adiciones a mi colección, me gusta mucho el aroma porque no es como nada que tengo. Es un poco dulce al principio pero después el aroma cambia completamente. No puedo explicarlo bien, pero les recomiendo que lo prueben. Lo mejor es que es uno de los más baratos perfumes buenos que pueden comprar. 2: Daisy, by Marc Jacobs: This was my 2013 birthday gift from my parents, it's fresh and flowery and it's perfect for every season. My only problem? I (accidentaly) dropped the bottle and the inside tube got loose and now it's kinda tricky. Este fue my regalo de cumpleaños 2013 de mis padres, es fresco y floral y es perfecto para cualquier estación. Mi único problema? se me cayó sin querer y el tubito de adentro se soltó, y ahora es un poco complicado. 1: Coco Madmoiselle, By Chanel: my favourite ever perfume. it's strong but lady like, and it lasts for ages. I got this perfume in the duty free in Paris' airport. I remember I tried this (and bought it) and when I got on the plane, I fell sleep for about 10 hours. When I woke up, I smelled it like the first moment I tried it and knew I've made on of the best purchases ever. this is my go to perfume and every time I use it, people complement my smell... that came out wrong. I have actually never bought my own perfume or been given one! My sister is a hoarder & her favourite is also Coco Mademoiselle by Chanel! She's always telling me, if you are going to buy a perfume, buy that! Justo ayer compré la de Lady Gaga y justo por lo que comentas, es distinta a todas y me encanta! I actually don't wear perfume! It bothers my boyfriend, so it's one less thing I have to worry about! It will mean a lot if you could check my blog and maybe follow me if you like ?! So jealous of your Coco by Chanel perfume - it must smell divine! I use Daisy by Marc Jacobs regularly and quite like it. What a fabulous set, I love Daisy by Marc Jacob. Thanks for visiting. A great selection...I love Coco Chanel parfum!!! Great selection! I love perfumes and I go crazy every time I have to buy one! It's so hard to choose just one! I adore Coco Mademoiselle! So feminine and beautiful..